Trellises are widely used in the agriculture sector to support grape vines. It is made by interwoven wooden pieces in order to support the vines that are too fragile to support themselves and the harvests. 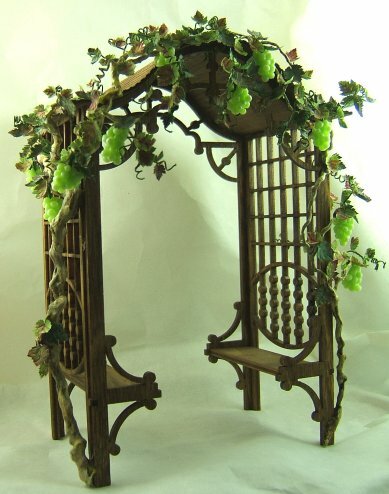 The garden supply stores do supply a variety of premade decorative trellis, but you will need at least an 8 square feet space for the vines to expand and handmade ones are usually more functional. Therefore, it would be easier and cost saving for us to build our own grape trellis. How to build a grape trellis? Firstly, determine on the number of grape vines you would like to plant, and calculate the amount of materials need. You will need materials like timber or pine wood for the posts, galvanized wires, cement, and post hole diggers. Go for wires that are sturdy and weatherproof to withhold the weight of the crops. Decorative metal trellises are definitely not a good choice for grape planting as they are good heat conductors. When the sun is very hot, the metal trellises will absorb the heat and it might stunt the growth of grape vines. Dig postholes that are at least 8 feet apart from each other. The length of the post, ranging from 3 feet to 8 feet tall, depends on different types of grape vines. Two feet of the post should be buried in the ground and then secured with cement. Posts in swales can be pulled out by the tension of the wires, so they will have to be secured deeper into the ground. Tension indicator springs should be added to these posts to absorb the excessive tension created by the wires. Run the first tier of the galvanized wires on top of the post from one to another horizontally. The second tier should be stapled 3 feet away from the first tier. Staple the wires to the side of the post twice to ensure the wires are attached firmly. Make sure that the wires are level and stapled tightly to the posts, as well as sturdy enough to withstand the weight of the vines and fruits. It would be better for us to know how to build grape trellis ourselves as it helps reduce the cost of planting grapes. Handmade trellises are usually more practical and long lasting compared to the ones that are sold for decorative purposes. And by building our own trellis, we get to choose suitable materials so that the trellises can last up to 20 years.